For the second year, I've had the frustrating privilege of unpacking and building little bikes that are much anticipated by our children, but which will have to stay in hiding for a little longer. 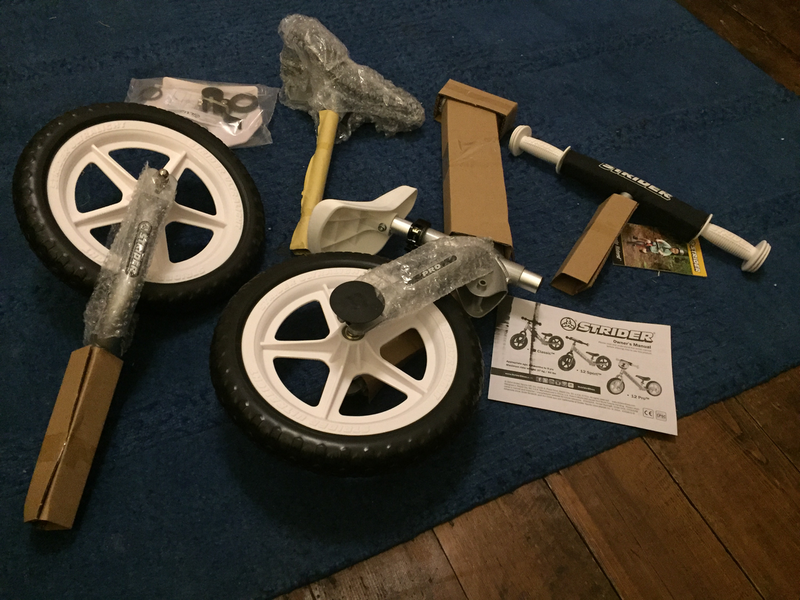 This Christmas, it's little Rhoda's turn to get her first balance bike, and in a departure from our recent loyalty to Islabikes, we've gone in a slightly different direction. 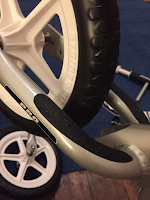 If you want to understand what balance bikes are all about, and why we would never touch a stabiliser ever again, we can write about that another time. Rhoda has been trying for some time now to make a start riding big sister Ruth's Islabike, and whilst Ruth was 23 months old when she got Rothan, Rhoda was nearer 16 months when she first gave it a go. The weight was just a little too much for her. In any event, Ruth is still some way off being ready for the next step. A few more laps round the bandstand for her! Fast forward a month and the girls found themselves at the NEC, trying out the competition. The lady who imports Strider bikes gave a very strong and knowledgable pitch for her product, when I explained that we had a Rothan and were considering a second balance bike. Long before we had finished talking, Ruth and Rhoda had both selected a display model to play with. Rhoda found the top of the range aluminium Strider, the 'Pro' (I'm not sure how a toddler is a 'pro' at anything, but there you go!) much easier to handle, and was making a significantly better fist of walking with the bike. Ruth was shifting, too. You will have gathered by now that we have purchased a Strider, but after a year of living with Rothan, what's it up against? The Islabikes Rothan is the baby of their range, but very much a member of the family and oozes quality. Thomas Ivor and Ruth had bikes in matching green paint, which Ruth kissed better when she chipped it! The bike has a v-brake on the rear, with an extra-small lever, a threadless headset with an adjustable stem, pneumatic (presta-valved! ), tyres on conventional spoked rims. Short of pedals and a front brake, it's a proper bike. It looks like a bike, it feels like a bike, mechanically it has everything in common with a serious bike from a serious manufacturer. It's a beautifully engineered piece. We've lived with Rothan for a year now, and Ruth loves her bike to bits. It's covered some miles, but now we will need to spend some money, because she's outgrowing the starter saddle, which has an integral seat post (£15.99 at the time of writing). Nevertheless we are pleased with our purchase, and we are glad we chose it - one should bear in mind that Ruth actually wanted a Strider like a little Australian girl she found on YouTube! So why, if we love Rothan so much, have we bought a different bike this time, and how does it compare? Let me get out of the way the things I don't like about the Strider, compared to Rothan, because the case for the change has to overcome some serious misgivings on my part. In my personal opinion it looks cheap, plasticky and gaudy. That may be saying more about me being a puritanical parent, or just a reflection of how we cycle and view bikes, I don't know, but we like quality products. The Rothan is a piece of engineering for toddlers. The Strider is brash, drawing on BMX styling - I couldn't bring myself to fit the number panel! The frame is agricultural, the headset is a bit rough and the other components are plasticky. Whereas Ruth kissed Rothan's chipped paint after a mishap in the park, I don't think the Strider, even this top-of-the-range model is the kind of bike that encourages children to look after it. It's toy-like. I genuinely didn't think the Strider was in the same league as the Rothan when we bought Ruth's bike last year. Hold on, though, let's just pick that apart. It looks cheaper because it is cheaper. Only two-thirds of the cost of a Rothan. And it includes a second seat with a longer seat post. The first seat is specifically designed to accommodate a child in a nappy. "No brakes!" I hear you cry. Well, no, but Ruth hasn't actually used hers successfully yet, and she's now nearly three years old. I reckon she'll quite possibly master pedals before brakes. The plastic wheels and solid foam tyres weigh less than those on the Rothan, and you can't get a flat tyre. Not sure you can argue against that when the rider is still in Huggies and can neither read nor write yet. The frame is nowhere near as beautiful, but at 2.2kg it weighs significantly less than the Rothan at 3.4kg. Weight is meant to be one of the biggest selling points for any children's bike. There's no brake, but there is a patented foot rest on the rear fork, which makes a good deal of sense when you see a more competent child tripping over their own feet as they accelerate the bike. When your feet are your main method of propulsion, you can use them pretty efficaciously for braking, too. The Strider was delivered promptly, it assembled quickly and easily, the only tool required being an allen key, which is included. My subjective opinion of the form may not be yours, but it functions just as it should. Second hand prices indicate that the Rothans are holding their value, which underscores the quality of that product and the respect people have for the brand, but also makes the low opportunity cost of getting your little one on a Strider before they're out of nappies a tempting proposition. 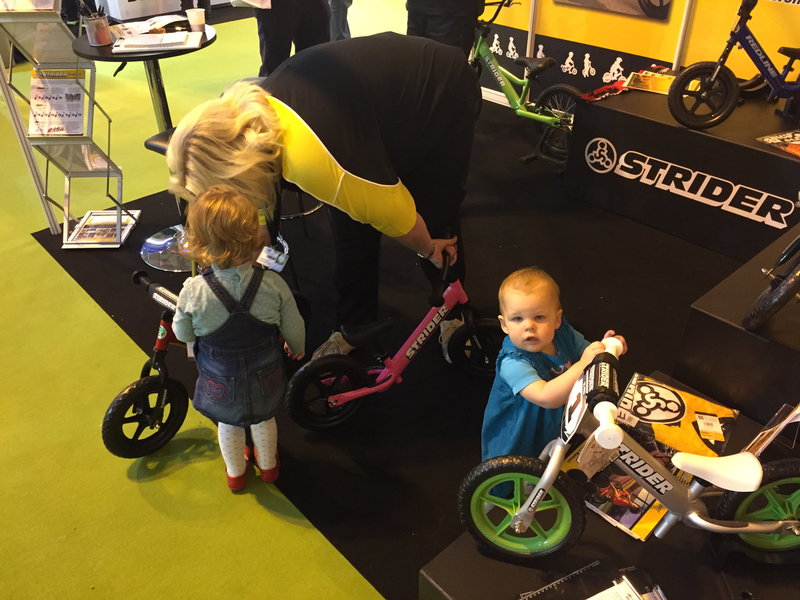 For the very youngest children (say, sub-21 months), we believe that the Strider 'Out-Isla's Islabikes', in a way that overcomes our manifold difficulties with the rest of the design. 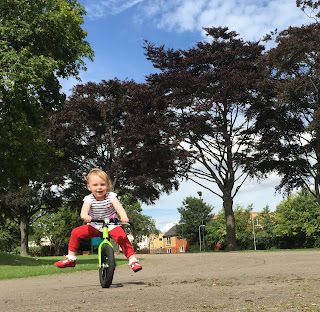 Islabikes have always made justifiably strong points about weight, and about fit. Though I prefer the Rothan in every other regard, for a child as young as Rhoda, that different in weight and therefore initial ease of balance is huge! She doesn't need a brake. She won't want to be fixing punctures (the Islabikes wheels are a swine to inflate because the access to the valve within such a small rim is tight). Yes, she may well fall off it. So what. 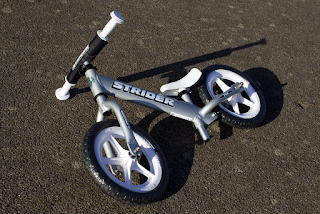 Bottom line - if I was buying for a slightly older child, I'd buy the beautiful Rothan again in a heartbeat; for an under-two, I'd seriously consider the Strider based on the price, simplicity and light weight. Since few parents have children quite so close in age as our girls, having two such bikes in the family is not necessarily an economic proposition, and personal preference and budget will come into play. 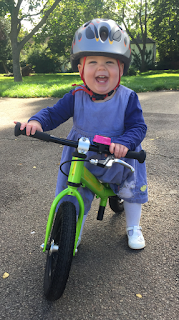 In a year's time, Ruth will most likely be well onto her first Islabikes Cnoc (for which we see no competition in our eyes) and Rhoda will then have the choice of steeds. It will be interesting which way she goes, and in the meantime how our experiences of teaching on the two bikes differ. We will report back in due course. For the moment, I'd better hide the evidence before the girls wake up! Islabikes' Rothan is available from the manufacturers' website for £149.99 at the time of writing, with a choice of seat post lengths. 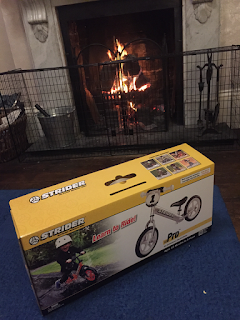 We bought our Strider 12 Pro from Action Kids for £100.